Sometimes you get tired of eating just strawberries. Not often, of course, just sometimes. If that happens, then there are several ways to dress up those luscious berries. You can macerate them in hibiscus and vanilla syrup (something I've done twice this month already). You can pair them with some young Brie cheese and serve as canapés. You can make the much-loved British summer classic, Eton Mess. You can go all Nigella-esque and serve them with a good balsamic vinegar and some brown sugar. There are plenty of alternatives to just plain red berries. 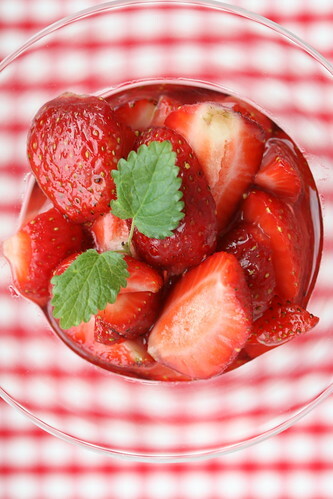 Or you can cook up a simple basic syrup, spike it up with a citrus liqueur and drizzle over the berries. Like I've done here.. Mix sugar and water in a small pan and bring to a boil. Simmer for 10 minutes, covered. Remove from the heat and cool for about 15 minutes. Stir in the Cointreau. Rinse the strawberries, drain thoroughly. Hull the berries and cut into half or quarters, depending on the size. Place in a bowl, drizzle with the syrup and stir gently. Place in the fridge for 30-60 minutes. (Not longer, as the berries will become unpleasantly soggy). Serve. (A dollop of whipped cream or softened mascarpone is optional). * Cointreau is gluten-free, so this spiked dessert is also suitable for those with coeliac disease. Strawberries are FABULOUS! Thanks for the new tip... will have to try that if the next batch lasts that long. I love all the variations you mentioned, but strawberries with amaretto syrup is my favorite. Try it sometime, if you haven't already. love fruit salad with cointreau! the strawberries looks so pretty! Everything on your site looks so delectable. What wonderful photography. We were thinking along the same strawberry-with-variations lines this week. Do like the sound of your boozy syrup - mmmm. Adoro di mangiare le fragole con il Cointreau , hanno un gusto particolarissimo! Lovely , lovely, lovely recipe! Easy yet so tasty!